Face Lift - Frisco,TX - Plano,TX - Dallas, TX - Ken Smart M.D. Old-fashioned skin-only facelift techniques used in the past did not resolve the true problems associated with aging, and often led to an operated-on, windswept appearance and generally resulted in an early recurrence of the signs of aging. Total rejuvenation of the face and neck is the ultimate goal of Dr. Ken Smart. With facelift surgery, he seeks to improve the signs of aging by addressing the deeper structures of the face, including the muscle and fat that is responsible for sagging skin and deep furrows that come with age. Dr. Smart offers his fully-equipped surgical facility and knowledgeable staff for patients interested in facelift surgery in Frisco, TX. Dr. Smart’s philosophy for facelift surgery gives a more natural look that restores the youthful appearance of the face without giving an unnatural appearance. For a full facelift, the incisions start behind the hairline in the temple and then move down in a natural crease in front of the ear or just behind the cartilage of the ear. It then curves around the ear lobe and goes back into the hairline if a neck lift is being performed, as well. Using the newest facelift techniques available, Dr. Smart repositions the deeper structures of the face to their normal youthful position. This includes moving the cheek fat pads back up to their normal position below the eye and tightening the muscles of the jaw line to eliminate the jowls. When performed in combination with a neck lift, the muscle of the neck is also tightened to eliminate looseness and improve the profile. Excess skin is removed in both these procedures, but is not the sole means of improvement. Traditionally, the neck is treated in conjunction with the facelift. However, some patients may exhibit excess fat and muscle laxity that can be addressed with a combination of liposuction and muscle tightening without excising skin. In addition to full facelift techniques, Dr. Smart is trained and experienced in the newer minimally invasive short scar techniques. He is able to perform the mini facelift, as well as provide facial implants to help you achieve your desire looks without a full face lift. These less invasive procedures may also be more affordable. It is common to perform other procedures in combination with a facelift to achieve total facial rejuvenation. Most commonly, we perform a neck lift with facelift surgery. We also frequently perform the endoscopic brow lift, upper and lower eyelid lifts, lip and chin augmentation and CO2 laser resurfacing. We can also recommend a personalized combination of skincare products to complement the effects of the procedure. During your cosmetic consultation with Dr. Smart, he can give you more information on any of these procedures, and present you with all of your surgical options. The cost of your treatment will be affected by the extent of procedure you undergo and any other treatments you choose to receive During your facelift consultation at our office, we can discuss the cost of your surgery and the best options for you. Your individualized quote will also include the surgeon’s fee, the anesthesiologist’s fee, and the facility fee for your procedure. Dr. Ken Smart discusses the right time for patients to undergo a facelift and the results they can expect to achieve. Candidates for a facelift are in overall good health and must be non-smokers. There is no particular age limit for facelift patients. Most patients are anywhere from 40 to 60 years old, but healthy patients in their 70s and 80s can safely undergo a facelift. In addition to exhibiting the signs of aging that a facelift can correct, patients should have realistic expectations of what can be achieved. Your facelift can be performed at our fully accredited ambulatory surgery center located conveniently in our medical building. For your convenience and safety, we can also perform surgery at any of the Plano, Frisco, and Allen-area hospitals where Dr. Smart maintains surgical privileges. He performs most of his facelift and neck lift surgeries under general anesthesia. However, in certain circumstances they are performed under deep IV sedation. If you are receiving general anesthesia, you will receive safe, personalized treatment from a board-certified anesthesiologist. You will need direct nursing care the night of your surgery. Some patients spend one night in the hospital or other home nursing care arrangements can be made. You will have a bulky head wrap on when you wake up after surgery. You may or may not have drains. Pain can usually be controlled with oral pain medication, but if necessary IV pain medication will be given. Our office is known for beautiful and natural facelift results. Your dressing will be changed the morning after your facelift procedure, either in the hospital or in our office. If you do have drains, they're usually removed that morning. Dr. Smart begins removing your sutures in stages, usually about five days after surgery. The final sutures come out after two weeks. At this time, most of the bruising has usually resolved but it can take several more weeks for the swelling to go away. 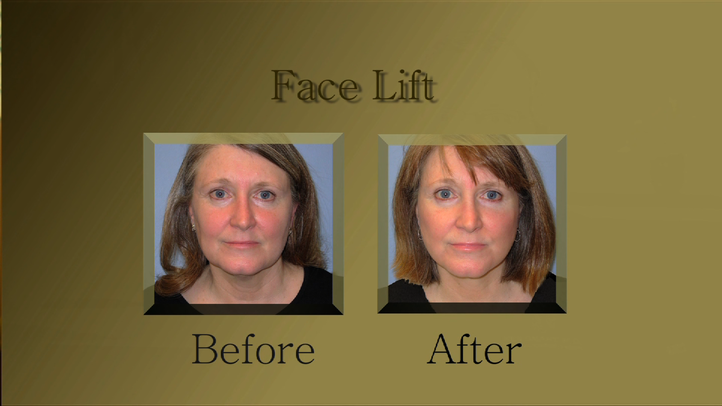 Our office is known for beautiful and natural facelift results. If you live in Frisco, Plano, McKinney, Allen, or any of the surrounding Texas communities, and you are interested in face lift surgery, contact our plastic surgeon Dr. Ken Smart today.